Most people know that acupuncture comes from China, but many do not know the theoretical basis for this therapy. What does the needles do, and how can the therapist explain any effect of the needles? Is there any natural explanation if the therapy works, or do we have to enter the supernatural realm? 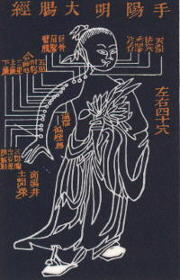 Acupuncture has been practiced in China for several thousand years, the technique was taken to Europe by Jesuit monks who had been to China (1). They constructed the Latin word acupunctur which means to prick with a sharp object. Acupuncture has been practiced in Europe ever since, but it was not widely known in the West before president Nixon visited China in 1971. Television commentaries showed Chinese physicians doing complicated surgery without any other anesthesia than acupuncture. The theoretical basis for acupuncture is based on eastern religion and philosophy. The theory of a spiritual power Ch'i or Qi that permeates everything is central in acupuncture. This power is revealed as Yin and Yang which have to be in balance. The point is being made that humans have a spiritual astral body as well as a physical body, and the ethereal body is connecting these together. 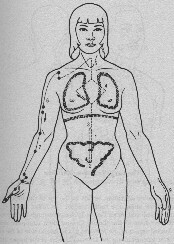 The ethereal body has 12 meridians that are considered to be channels for the energy Qi. Sickness and diseases are caused by disturbance of the energy balance in the meridians. Bert Yoga Jansen writes: "The ancient way of thinking is this: The energy called Qi (Prana) is floating through the 12 great meridians of the ethereal body, and disease is caused by disturbance of this life energy. Ch'i is floating in an inner circuit of the human ethereal body. At specific places the tracks are meeting, and these points are called acupuncture points" (3). Through manipulation of the balance between Yin and Yang in the body, the acupuncturists try to re-establish health and well-being. The manipulation consists in inserting needles at specific acupuncture points. Vilhelm Schelderup, author of New Light on Medicine, writes: "According to Chinese tradition the acupuncture points are like junctions of the organism's energy circulation. Through these points the inner life energy is connected to the external world" (1). Traditionally the acupuncture points have been treated with needles, heat or massage. The use of heat is called moxa. Today many acupuncturists use electricity, ultrasound, magnets, laser and even colored light at the acupuncture points. Acupuncture of the ear, auriculotherapy, was invented by the French physician Paul Nogier. In 1969 he published a theory in which he postulated that all organs of the human body are represented by specific acupuncture points in the ear. Auriculotherapy has also been known in China, but this method was more or less forgotten in China when Nogier published his theory (1). The theories of acupuncture are not based on scientific research. The ancient Chinese book I Ching (book of transformation) makes an important fundament for Chinese medicine and philosophy. Schelderup writes about this book: "It teaches us to consult reality by interpreting the pattern by which the fortune telling sticks divide. We must have in view that this is happening through a ritual ceremony in which we totally empty our mind for other thoughts, and our inner awareness is adjusted to become resonant with the greater reality we want to consult" (1). The theories of acupuncture are closely related to other spiritual therapies. The idea of human spiritual nature is broadly speaking the same, and one type of therapy may be combined with another to achieve an amplified therapeutic effect. Hypnosis is a technique that gives the therapist control over the patient's mind and will. Everybody is not receptive to hypnosis. Several experiments with hypnosis have shown that only 15-20% are receptive to deep hypnosis. Experiments in Norway and other countries have shown that all people participating in the experiments become receptive to hypnotic trance when they get simultaneous acupuncture (1). These results strongly indicate that acupuncture has influence to the patients on other levels than the physical realm. The awareness and receptiveness for control by external powers are influenced as well. Schelderup writes in his book: "The relation between acupuncture and hypnotic trance has undoubtedly been known by Chinese acupuncturists. This was probably the reason for keeping secret certain techniques of acupuncture. The master would only teach these techniques to those of his pupils who were considered mature and had a certain moral standard. So there is a more occult tradition in acupuncture." He also writes that this caused persecution of acupuncturists in China during the Ming dynasty. "Probably it has been discovered that acupuncture was being abused in an occult setting to promote political intrigues or even conspiracy against the emperor" (1). Many have tried to explain the effect of acupuncture by means of scientific theories, but none of these are very convincing. The acupuncturist Oddveig Birkeflet writes in the Norwegian nurses' periodical: "The analgesic effect of acupuncture is well explained by the spinothalamic gate theory" (4). It is true that a limited analgesic effect may be achieved by stimulating certain nerves with pain or electrical impulses, this is the principle of transcutaneous nerve stimulation (TNS). But this theory can never explain any healing effect of acupuncture. The author writes in the same article: "The ideas of energy, Qi, Yin and Yang are 'map and compass' to understand the anatomy and pathology of man" (4). The truth is that nobody has been able to give any reasonable explanation of the healing effects of acupuncture without reference to spiritual power or energy. Schelderup, who is an acupuncturist, emphasizes this point in his book: "Today we have no real alternative to explain what really happens during acupuncture" (1). It has been said that alternative medicine is safe and effective therapy with no harmful side effects. But this is only a qualified truth. Medical literature contains many documented cases of complications following acupuncture. Lung puncture, heart tamponade and life threatening infections are reported . In the United Kingdom transmission of contagious hepatitis has been documented as a result of acupuncture (5). Medical procedures may imply similar risks for complications, and physical side effects alone do not disqualify a specific type of therapy if curative effect can be documented. But to evaluate a spiritual type of therapy like acupuncture, the most important thing is to know what happens in the spiritual realm. We must make up our mind about what we believe and by which powers we want to be influenced. If acupuncture is a spiritual kind of treatment, we must ask where the power comes from. For a hindu or taoist it may be natural to seek Prana or Qi as sources of spiritual energy. But the Bible warns Christians not to seek spiritual power from any other sources than Jesus Christ and the Holy Spirit. The most important question is not whether acupuncture works or not, but if it does, by which spirit does the power come? 1. Schelderup, Vilhelm. Nytt lys på medisinen. Cappelens forlag, Oslo 1989. 2. Fersling, Poul. Naturligt övernaturligt. Bokförlaget Forum AB, Stockholm 1989. 3. Jansson, Berg Yoga. Yoga, meditasjon, reinkarnasjon. Grøndahl og søns forlag, Oslo 1974. 4. Birkeflet, Oddveig. Sykepleien fag nr 6 1992, organ for Norsk Sykepleierforbund, Oslo 1992. 5. Alternative Therapy. British Medical Association, London 1986.